I first tasted these exotic delicacies when I was invited to the launch of their recipe book by Enfants du Mekong, a charity dedicated to setting up sponsoring for disadvantaged children in Laos and other South East asian countries. Their new recipe book are a collection of best-of by sponsor-families in France and the UK and is fast becoming a favorite in our kitchen! I served these madelaines last week-end to my globe-trotting parents with a cup of green tea and some raspberry and green tea muffins… Not quite the English tea-time they no doubt expected but a brilliantly exotic take on that and very much loved too. Preheat the oven at 180℃. Whisk the butter and sugar together until light and fluffy. Add the eggs one at a time then the flour, a pinch of salt and the matcha tea powder. I found mine at the Japanese Center in London (Lower Regents street). Spoon the mixture into madelaines or any small pans tray and bake at 180℃ for 18 minutes. Serve with a cup of very good green tea for an unusual and subtle taste experience! 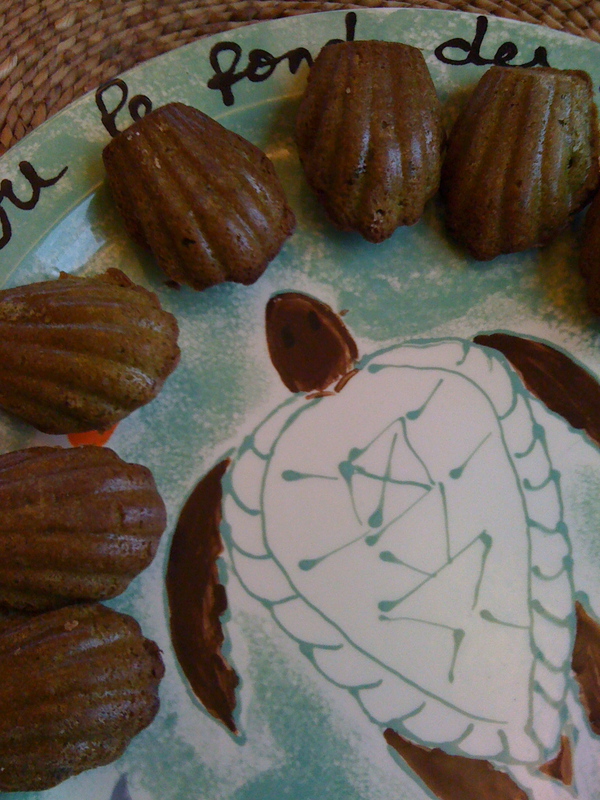 This entry was posted in autumn, baking and tagged green tea, japanese, Matcha, tea-time. Bookmark the permalink.